Foran, Max L.. "Calgary". The Canadian Encyclopedia, 05 March 2019, Historica Canada. https://www.thecanadianencyclopedia.ca/en/article/calgary. Accessed 18 April 2019. The earliest evidence of human settlement in the Calgary area, dating back some 12,000 years, consists of spear points found in ploughed fields east of the city. This period coincided with the end of the last ice age, when glaciers from the Canadian Shield receded from the valley of the Bow River. The successive cycle of habitation by Indigenous nomadic hunting peoples over the next 10,000 years included at least three dominant cultures. The last, some 2,000 years ago, was the Blackfoot from the Eastern Woodlands. Among later arrivals were the Sarcee, who came from the north in the 1700s, and still later the Stoney	from the Manitoba area. Archaeological evidence of prehistoric peoples is confined mainly to campsites and bison kills. Fireplaces, storage pits and tipi	rings date back more than 4,000 years. Sites depicting religious customs also exist in the form of fieldstone medicine wheels, cairns and effigies, while a pictograph	panel can be seen on the Big Rock near Okotoks, south of Calgary. 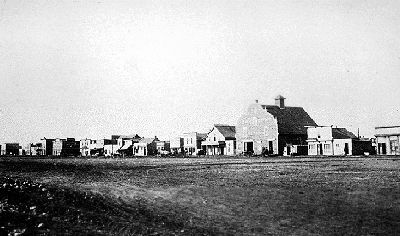 Calgary's growth between 1885 and 1894 was largely the result of expansion of the cattle industry (courtesy Glenbow Archives). The westward movement of the fur trade brought the first Europeans to the area in the late 18th century. David Thompson, then of the North West Company, wintered near Calgary in 1787, and Peter Fidler of the same company travelled near the region in 1792. In the late 1860s bison hunters from the United States appeared in increasing numbers, joined by illicit-whisky traders who erected a network of fortified posts in southern Alberta	from which they sold alcohol to the local Indigenous peoples in return for bison robes. One such post was located in the Calgary area near the present-day Glenmore Reservoir. The railway reached Fort Calgary in 1883 and the CPR subsequently laid out its Calgary town site west of the Elbow and south of the Bow rivers (courtesy PAA/Ernest Brown Coll). 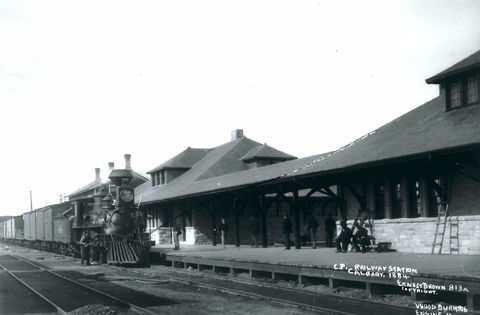 The railway reached Fort Calgary in 1883 and the Canadian Pacific Railway subsequently laid out its Calgary townsite west of the Elbow River and south of the Bow River. Calgary was incorporated in 1884 as the first town in what is now the province of Alberta, receiving city status in 1894. 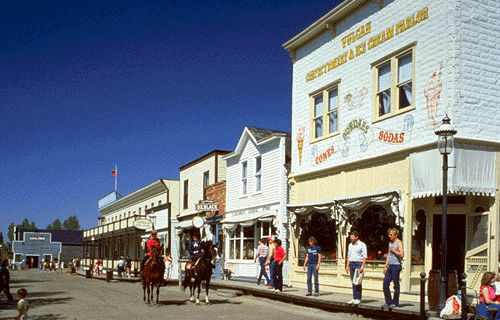 Calgary's economic growth was closely associated with the development of the ranching industry, and with the city's focal position as the chief transportation centre in Alberta. Before 1906 the open-range cattle industry was the dominant economic activity, and Calgary experienced its influence commercially, industrially and socially. The city's first millionaire, Pat Burns, built up the largest integrated meat business in Canada. The beef cattle industry, especially following the crippling winter of 1906-07, contributed a volatile element to Calgary's urban development, despite the city often being referred to as a thriving cattle town. 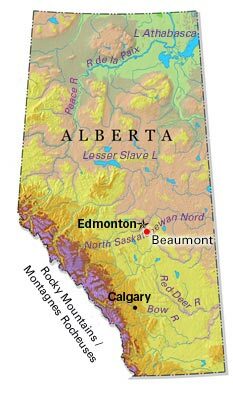 The opening of southern Alberta to cash crop farming in the early 1900s brought rapid growth in Calgary, which increased its population by more than 1,000 per cent from 1901 to 1911. Rails stretching in all directions solidified the city's position as the prime distributing centre for south-central and southern Alberta. After 1912 Calgary's development slowed along with that of rural Alberta, especially after the end of the immigration boom and the onset of the First World War. A third and crucial element in Calgary's economic development was the emergence of the oil and natural gas industries. Beginning with the first strike in 1914 at Turner Valley, a few kilometres southwest of Calgary, local entrepreneurs, such as William S. Herron, Archibald W. Dingman, and Robert A. 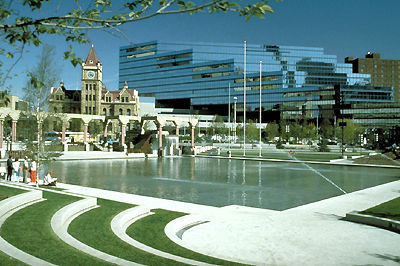 Brown, continually promoted Calgary's future as a major oil centre. Alberta's first oil refinery opened in Calgary in 1923. Subsequent important discoveries at Turner Valley in 1924 and 1936 established Calgary's pre-eminence in Canada's oil and natural gas industries. When the lid was lifted off western Canada's vast oil reserves with the major discovery at Leduc	in 1947, Calgary stood ready to reap the rewards. The subsequent phenomenal growth of the city from a regional centre in southern Alberta to a metropolis of international status is a direct offshoot of its diversifying economy and its increasingly cosmopolitan population base. Another aspect of Calgary's development is a long-standing and intense rivalry with Edmonton. The two Alberta cities have competed keenly at every level, and have produced one of Canada's most identifiable urban rivalries, which is expressed in professional sports, politics and culture. Calgary was the fastest-growing city in Canada between 2006 and 2011, with Edmonton a close second. Its growth is due in large part to the continued prominence of the oil and gas sector as well as an increasingly diversified economic base. 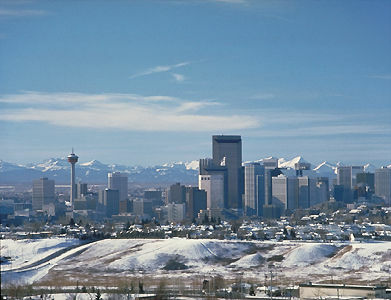 Calgary skyline, shown against the backdrop of the Rocky Mountains (photo by Larry Fisher/Masterfile). The Bow River valley forms the main topographical feature of the city. Three smaller streams — the Elbow River, Nose Creek and Fish Creek — flow through the city into the Bow, creating a configuration of valleys and bluffs. In addition, the placement of railways also affected spatial growth patterns. The main business section is compressed between the Bow River and the Canadian Pacific Railway main line. Residential development tended to follow the river valleys, originally along the Elbow, and more recently along the Bow to the northwest and southeast. Other influencing factors include the University of Calgary	and the international airport to the north, and the Glenmore Reservoir, Tsuu T'ina Indian Reserve and Fish Creek Provincial Park to the south. Manufacturing districts are located to the east, in the railway suburbs of Ogden, and in zoned areas along the railways. Formal planning began in 1911 when an English town planner, Thomas Mawson, was commissioned to prepare a comprehensive scheme. Though his extravagant proposals were never implemented, his ideas have surfaced periodically in civic planning initiatives. A zoning bylaw was instituted in 1934 and a planning department established in 1950. In 1963 the city adopted its first general plan for controlling future development. The Alberta Planning Act (1977) directed Calgary to adopt a more regional approach to planning. The city plan, called Plan It Calgary, was finalized in 2009 and includes plans for development and transportation. The plan was developed after imagineCALGARY, a public outreach initiative in 2005 that included 18,000 city residents. The plan addresses land use, development and transportation, as well as environmental health, economic vitality and social well-being. The plan sets out a long-term direction for the growth of Calgary by 1.3 million people over the next 60 years. Calgary has had steady population growth since the Second World War, showing only minor decreases in 1983 and 1984 due to a collapse in oil prices, and slowing growth after the beginning of the recession in 2008. This growth is due both to migration within Canada, as well as immigration from other countries. For the former, the province’s oil and natural gas industry has been especially important, attracting new labour from as far away as the Atlantic provinces. Similarly, foreign immigration has increased steadily throughout the 2000s. According to the 2016 census, people citing English origins make up the largest ethnic group, at 20.8 per cent of the city’s population, followed by Canadian (19.2 per cent) and Scottish (16.7 per cent). Visible minorities account for 36.2 per cent of city residents, with South Asian, Chinese and Filipino people comprising the largest communities within this group. Calgary’s economy has historically been associated with commerce and distribution. Its more recent emergence as a world energy and financial centre is reflected in its high-ranking national position in the location of head offices, including those of TransCanada, Suncor Energy and Enbridge. The workforce, therefore, shows a heavy orientation toward the professional, management and commercial sectors. Trade occupations have traditionally been dominated by the building, railway and oil supply trades. Manufacturing has diversified from products for the agricultural, oil and natural gas industries to include products from the food, machinery, furniture, chemicals, fabricated metal, motion picture making and high-technology sectors. Since the 1980s, Calgary’s economy has been heavily dependent on oil, a single, high-risk industry. As with much of Alberta, Calgary tends to suffer when oil prices are low and prosper when they are high. Most of the nation’s oil and natural gas producers and many of the nation’s coal companies are headquartered in Calgary. Over time, the city’s economy has become more diversified, but energy remains its most important economic sector. Canadian Pacific Railway has world-class freight classification yards at Alyth and major repair facilities at Ogden. Canadian National Railways has container and intermodal services in its Sarcee yards. Calgary's international airport is one of the largest and busiest in Canada. The city's municipal transportation system consists of buses supplemented by a light rail transit (LRT) system (see CTrain). Calgary Municipal Building and City Hall (photo by Bilodeau/Preston/Take Stock). The government of the city was conducted under powers originally granted by the Northwest Territories and later, in 1905, by the Government of Alberta. Most recently its powers are granted through the Municipal Government Act (1968). Before 1909 civic business was conducted almost entirely by council alone. Until 1999 the system of a council and board of commissioners was in operation in one form or another. This system was replaced with a single chief administrative officer, now known as the city manager, and an executive team to oversee city operations and ensure that council's decisions, policies and programs are executed. The mayor and council members (representing the city's wards) fill three-year terms. The municipal franchise was reformed to exclude plural voting in 1913 and property restrictions in 1915. A preferential system of voting was initiated in 1916 and continued until 1958. Calgary’s municipal politicians have been important in provincial and federal politics. Grant MacEwan, mayor between 1963 and 1965, later became the province’s lieutenant-governor. Calgary’s 32nd mayor, Ralph Klein, served as premier of Alberta between 1992 and 2006. ​Naheed Nenshi was elected mayor of Calgary in 2010, becoming the first Muslim mayor of a major North American city. Winner of the 2014 World Mayor Prize, Nenshi was re-elected in 2013 and 2017. Heritage Park celebrates Calgary's early history as a NWMP post and ranching centre (photo by Bilodeau/Preston Ltd./Take Stock Inc). Calgary home of the Stampeders (courtesy Calgary Stampeders). Cultural and recreational facilities have reflected Calgary's recent growth. Educationally the city is served by the University of Calgary , Southern Alberta Institute of Technology, Mount Royal University, Bow Valley College, Alberta College of Art and Design and several other private post-secondary institutions. Major cultural facilities include the Glenbow Museum, Fort Calgary Interpretive Centre, Telus Spark science centre, and Heritage Park Historical Village. The Epcor Centre	for the Performing Arts is home to the Calgary Philharmonic Orchestra and three professional theatre companies: Alberta Theatre Projects, Theatre Calgary and One Yellow Rabbit. The centre includes the 1,800-seat Jack Singer Concert Hall. 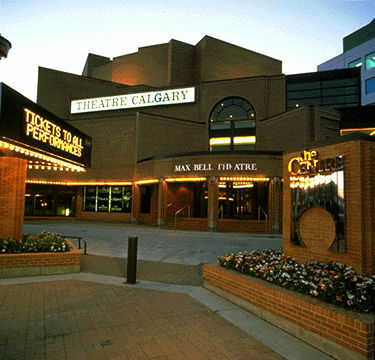 Calgary also has a professional opera company, Calgary Opera, and is home to the Alberta Ballet Company. The Calgary Chinese Cultural Centre is modelled after the Temple of Heaven in Beijing, China, and is located in the city's Chinatown. Calgary features several major cultural attractions and festivals throughout the year, including the Afrikadey! (African festival), International Blues Festival, GlobalFest and the Calgary Folk Music Festival. The Honens International Piano Competition attracts performers from around the world, while the Calgary International Children's Festival is a cultural journey for the young. 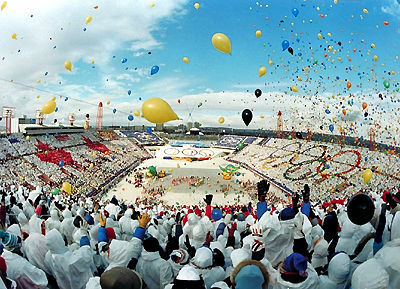 Opening ceremonies at the Calgary Winter Olympic Games. The greatest concentration of enclosed spectator and exhibition facilities is in Stampede Park, the home of the world-famous Calgary Stampede . 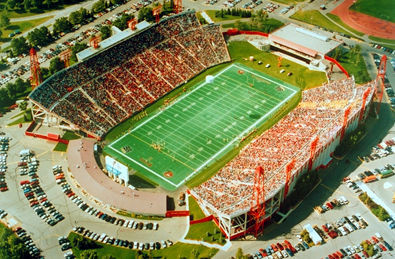 Also, the nearby Scotiabank Saddledome, built for the 1988 Winter Olympics, is home to the Calgary Flames of the National Hockey League. The city's other professional sports teams are the Canadian Football League’s Calgary Stampeders and the Calgary Roughnecks of the National Lacrosse League. Canada Olympic Park features world-class ski jumping, bobsled and luge facilities. The enclosed 400 m Olympic Oval on the University of Calgary campus is one of the world's best speed-skating venues. Spruce Meadows is an internationally known equestrian show-jumping centre. Calgary boasts the second largest zoo in Canada, which includes a prehistoric park. There are two large urban parks, Fish Creek Provincial Park and Nose Hill Park. Another attraction is Devonian Gardens, a one hectare indoor garden in the heart of the downtown area. Heritage issues are monitored by the Calgary Heritage Authority, which advises city council and promotes the restoration of heritage buildings within the city. In 2002, Stephen Avenue, formerly 8th Avenue, was designated a national historic district. Calgary developed lifestyle amenities consistent with its status as a winter city. Its Plus 15 System is a network of enclosed walkways to most of the downtown buildings. More than 16 km of walkways and 59 bridges facilitate comfortable year-round movement for pedestrians and shoppers. The city is also encircled by 500 km of maintained pathways, ski trails and bikeways that enhance a sense of the great outdoors, and which enable quality recreational activities regardless of location. Suggested Reading R.P. Baine, Calgary: An Urban Study (1973); B.M. Barr, ed., Calgary, Metropolitan Structure and Influence (1975); Hugh A. Dempsey, Calgary: Spirit of the West -- A History (1994); Max L. Foran, Calgary: An Illustrated History (1978), Citymakers: Calgarians After the Frontier (1987), Icon, Brand, Myth: The Calgary Stampede (2008)and Expansive Discourses: Urban Sprawl in Calgary, 1945-1978 (2009); Jean Leslie, Glimpses of Calgary Past (1994); J.W. Grant MacEwan, Calgary Cavalcade (1975); Donald B. Smith, Centennial City: Calgary 1894-1994 (1994) and Calgary's Grand Story: The Making of a Prairie Metropolis from the Viewpoint of Two Heritage Buildings (2005); Beverly A. Sandalack and Andrei Nicolai, The Calgary Project: Urban Form/Urban Life (2006); Fred Stenson, The Story of Calgary (1994); Tom Ward, Cow Town: An Album of Early Calgary (1975). The official website for the City of Calgary, Alberta. Check out the latest news and events for this dynamic prairie city.